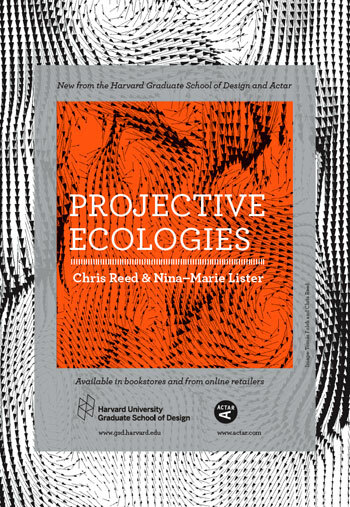 Projective Ecologies, by Chris Reed, ASLA, founder of Stoss Landscape Urbanism, and Nina-Marie Lister, Affil. ASLA, professor at Ryerson University, is a timely overview of contemporary thinking about ecology and design. The book is organized conceptually, moving from critical foundations to the connections between nature and culture, the relationship between urban design and ecology, and, finally, to new ways of unifying ecology and design. Previously-published seminal essays in ecological and design theory are interspersed with new contributions, effectively reframing and clarifying some of the concepts explored in the landscape urbanism movement. Projective Ecologies uses ecology as a lens for understanding the role of design in a complex, interconnected, and changing world. Reed and Lister describe how ecological thought has shifted from classical determinism — epitomized by the notion of linear ecological succession toward a stable climax state — to a complex systems approach in which ecological systems are interconnected, self-organizing, relatively unpredictable, and constantly changing. With this new thinking, human settlement is not separate from nature. Instead, human activity and nature are inextricably bound. Therefore, we can never successfully control ecological systems from a top-down perspective; we can only manage our own activities within them. This shift in thinking demands new approaches to large-scale environmental design. What does it mean to design within a complex and dynamic ecological system? What constitutes success in ecological design when the end goal isn’t a predefined climax community? Now, instead of imposing order on an ecological system to achieve a desired end state, the designer works within the ecological system to guide it to a state of relative stability. A truly sustainable complex-systems approach to large-scale design involves the adaptive management of systems not entirely within our control. This approach may become more critical as global climate change threatens to destabilize and alter the ecological systems we depend upon. Jane Wolff’s excellent contribution, “Cultural Landscapes and Dynamic Ecologies: Lessons from New Orleans,” explores the catastrophic failures of New Orleans’s infrastructure and flood control policies to align with the ecological reality of its dynamic delta environment. Notably, Wolff stresses the challenge of implementing a complex systems approach to flood management, writing: “Though design professionals and scholars have made a wide range of interesting proposals that capitalize on landscapes’ fluctuating tendencies, there has been much less conversation about the challenge of implementing such ideas.” Wolff stresses the need for public education about ecological problems in order to implement solutions, and suggests that in the case of New Orleans, the greatest barrier to implementing such an approach may be cultural. Projective Ecologies lays out an effective course for designing within a complex and changing world, and, in this sense, it’s successful. As the project develops, the next step may be to consider strategies for implementation, including how to communicate the adaptive management of complex ecological systems to the general public.